Also Recommended: Record of Lodoss Wars, Utawarerumono. Notes: Based on the novel series by the late Kurimoto Kaoru, who passed away in 2009. There are also two manga works based on different parts of the novel series. Their kingdom under attack by the Mongauli forces, the twins Rinda and Remus are escorted out of the castle, but are immediately confronted by Mongauli soldiers. However, they are rescued by a huge man with a leopard head who calls himself Guin. (Which is also just about all he remembers.) The three set out on a journey to bring the twins to safety. And that's barely even the beginning of the anime, much less the full novel series, of which the anime covers about sixteen volumes of the full 130 volume series, which should give some indication of the sheer scope of this series. It's one of the few that truly earns the term "epic" when it comes to the content, more so the sheer scope of it all. Comparisons have already been made to fantasy fare like Conan the Barbarian or Lord of the Rings, which is certainly not unfitting. For anime, titles like Record of Lodoss Wars would probably be a suitable comparison. Guin Saga is also very stylistically pure, which is both its greatest strength and its main weakness. Instead of broadening its audience, the show keeps to a rather set tone, which will probably alienate as many as it enthralls. It's not an overly flashy show -- magic effects aren't abundant -- but the character designs are clear, imaginitive and distinct; you won't ever mistake one character for another. And the settings are spectacular, to say the least. The animation is generally good, given that this is a TV series, but it's here you'll find some of the show's limitations. Shameful as it is, not all episodes will look as great as the opening episode. The CG, however, looks great whenever it's in use; a far stretch from the hilariously clumsy CG usage for the war scenes in Utawarerumono. Some of the plot elements might have some people rolling their eyes. The kingdom of the main characters, Remus and Rinda was overrun by enemy forces, and they are saved by a large barbarian-like man, you say? But oh, no, our friends' forces are beset with enemy forces far superior. Oh, I wonder if reinforcements will arrive in the nick of time. But to get their help, our main hero must fight the village's mightiest warrior to prove himself worthy. Guin Saga is this and more, and you certainly have to be in the mood for that sort of thing. Confoundedly enough, the more interesting parts tend to come later, when political intrigue enters the equation. This is unfortunately also where the bad parts of the dub does its darnedest to prevent you from taking it seriously. Remus is also very likely to get on your nerves at some point, being the whiny brat that he is. Also, Istavan (the dashing rogue, natch) immediately takes a liking to Rinda, which is a little bit unsettling, given that she looks like a prepubescent girl. A child. But then, political marriages is as much a part of this as anything else, and he's not the only one with an eye for Rinda, and for ambiguous purposes at that. Outside of that, there's little to complain about. The show knows its target audience and gives them exactly what they want and then some. Guin himself is a collection of mysteries and questions, while Remus and Rinda provides the show with a clear goal. The rest of the cast, much like a pyramid system of allegiances, fleshes out and gives life to the world around them all, and the show's end marks itself as merely a beginning of a larger story. 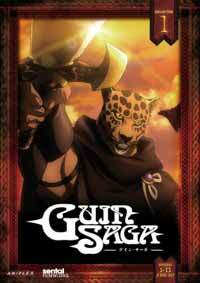 This will, of course, be another selling point, but Guin Saga deserves to be watched, even if it may never be completed in animated form. Even if many of the questions you have aren't even close to being answered, and alliances seems to have shifted on a moment's notice. (I guess Guin must have missed that memo.) When it comes down to it, there's just so much to see and experience in Guin Saga that I doubt anyone will really be disappointed with it. So.... four or five stars? That's the question, isn't it? I guess the occasional corniness of the dialogue or plot, and the annoyance over the ending being of the 'really just the beginning' variety is what's going to influence whether you think this is a three, four or a five star show. Recommended Audience: Like any sword and sorcery fantasy, expect a whole lot of redskirt death. The show isn't particularly grotesque, but human life is often cheap and taken away on a moment's notice. Fanservice is relatively light, limited to cleavages on display in the glamour of high life.